Not all roads lead to victory in New Hampshire. Most candidates at this stage in the campaign understand that their touted "paths to the nomination" have no chance of succeeding, but they carry on nonetheless, continuing to hawk the chances of their increasingly futile underdog efforts. It is in this bizzare self-applauding environment that today's announcement by New Mexico Governor Gary Johnson that he is effectively ending his campaign in New Hampshire rings with a rare and affecting humility. In a week dominated by damning new indiscretions levied against Herman Cain and the increasingly disingenuous nature of the Romney campaign's anti-Obama advertising, the humanity Governor Johnson displayed in confronting his inability to gain traction despite his extraordinary campaign efforts in New Hampshire should cause us to step back and wonder how exactly this man got away. 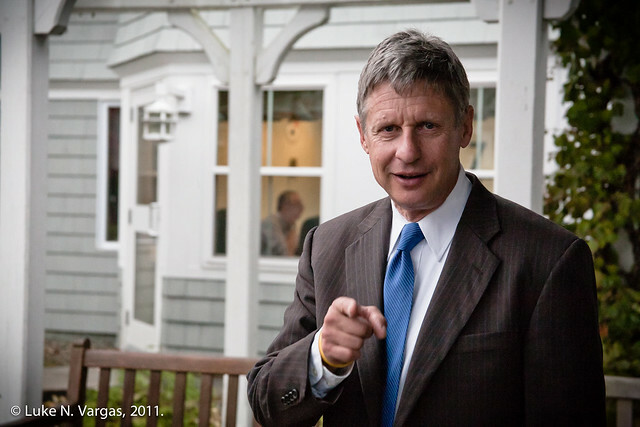 With a strong gubernatorial record of balancing the budget through his aggressive vetoing of legislation that would raise government expenditures, as well as his progressive stance on drug policy and other popular libertarian issues, it is easy to see why Johnson imaged New Hampshire would be a great place to peddle his message. So too, the efforts of Louisiana Governor Buddy Roemer to confront the growing and increasingly harmful influence of corporate money in deciding which candidates are presented to national television audiences have ironically resulted in his exclusion from all debates. Although Gary Johnson has made two such appearances on the debate stage, the two share backgrounds as successful, reform-minded governors who remained popular at the end of their terms, but have been kept in the wings and off the screen. To maintain that a figure Herman Cain (who, remember, languished on the debate stage without attracting attention for months) has all-along deserved such a national spotlight while Johnson and Roemer remain sheltered from the public eye is a troubling admission that should cause to acknowledge that the electoral process as it stands now has been seriously undermined. Earlier this Fall I showed up to photograph a Gary Johnson town hall meeting in a cozy, finely-decorated elementary school music room. In a fortuitous misunderstanding emblematic of his campaign's ineffective communication with voters, I asked a staffer when to expect the Governor's motorcycle pack to arrive at the venue. before being corrected that he was indeed pedaling a bike. 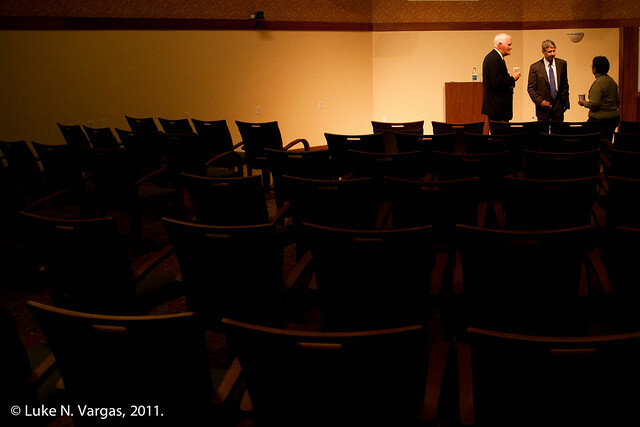 A few minutes after the event's scheduled start time, I loitered around in the parking lot for Mr. Johnson to arrive. A minivan pulled into the dark parking lot and watched as Johnson, a member of his staff, and another local supporter or politician who I assume intended to introduce the Governor to the crowd walked towards me. I addressed him with a commonplace "Good evening, Governor" as he walked by. A few feet from the door to the music room, Johnson's acquaintance patted him on the back, wished him the best of luck, and peeled off to let the Governor greet the crowd on his own. Besides three members of his staff, there were no voters there to greet him. With Manchester glowing in the eighty degree air, maybe the weather really was too beautiful for anyone to leave home. Maybe Johnson's message really is out of line with New Hampshire voters. Whatever the explanation, the whole thing saddened me unexpectedly, and left me confused as to what exactly was the matter with this campaign. With Gary Johnson effectively pulling out of New Hampshire, the conclusion is clear: if "America has a date with Liberty"—as Johnson's banner outside the event artfully read—they have soundly stood her up. In a rare unity of the 1st and 99th percent, the blame is ours collectively.